Quantum Leap, a TV sci-fi series with a humanistic touch, starred Scott Bakula as Dr. Sam Beckett, who thanks to a mistimed experiment finds himself travelling through time, "leaping" into the bodies of others. In "Dreams", Beckett assumes the identity of homicide detective Lt. Jack Stone. While investigating a particularly nasty murder, Beckett cannot shake Lt. Stone's own horrible memories. But, as Beckett's holographic observer Al (Dean Stockwell) points out, these memories may help Sam prevent Stone's own murder. 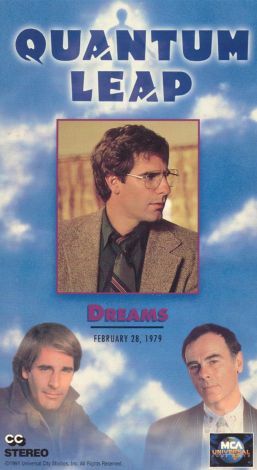 "Dreams" was originally telecast November 13, 1991.